This is the home of Douglas Twitchell and his family of puppets. Find information about our ministry presentations, our shows designed for family entertainment, and also play some games with Jeorge and the rest of the gang! 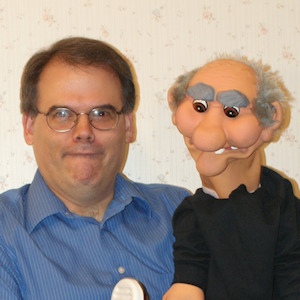 Doug has several puppets, each with a unique personality, that he uses to entertain and teach. The puppets tell Bible stories, sing songs (some familiar, some original! ), and entertain audiences of all ages. 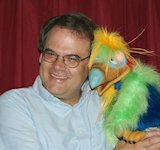 The puppets write their own material (with some help from Doug) so you won't be seeing tired old skits that fifty other ventriloquists have done! 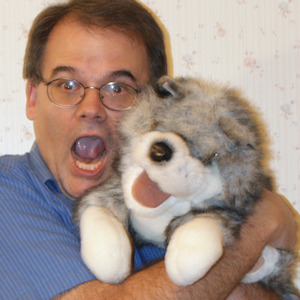 In case you were wondering, the fact that Doug's puppets are musical suggests that Doug is probably musical as well. Doug and his wife Laura often sing together as part of their presentations, accompanied by Doug on the guitar. Doug also plays the violin (especially when he visits nursing homes; some of the residents seem to love violins even more than puppets!). But (in case you were wondering) he never plays the violin while playing the guitar, or while doing ventriloquism! When Doug is invited to speak at churches, his primary purpose is not to entertain, but to teach. When puppets and music are used, they are used to direct the congregation's attention to the theme of the day, and the Scriptures we study in the devotionals and sermon. Doug has preached in Baptist, Advent Christian, Methodist, Lutheran, Pentecostal, Church of the Nazarene, and other denominations. When Doug is invited to secular venues, teaching is of a "moral" rather than "spiritual" nature, and is embedded in the skits performed.